Carmen Charriez, 71, has slept in this chair in her garage since Hurricane Maria hit and severely damaged her home. SAN JUAN — The stifling, rancid air felt like a sauna and reeked of unwashed socks. It enveloped the terminal, leaving no escape. It had been days, and people were desperate. Nervous, dripping with sweat, thousands of them found whatever space they could in Terminal C, peering out the unopenable windows of San Juan Luis Muñoz Marín Airport on Thursday for any signs of hope. With paper fans, they tried in vain to stir the stagnant air. Many in the crowd stared at the few working digital screens, among the airport’s only signs of power. But flight after flight disappeared from the list, taking hope with them. More than a week after Hurricane Maria hit this tropical island with horrific force, its winds howling at more than 150 mph, Puerto Rico remains a crippled island. Millions are still without power, food, or drinking water, a humanitarian crisis that has deepened by the day. Leaders of the US territory have pleaded for more assistance, and as the crisis has grown more desperate, criticism of the federal government’s response has mounted. For many, begging for aid seemed a waste of precious time. Getting off the island seemed the best, maybe the only, option. That’s why Heather Baus joined the teeming crowds at the airport, all trying to find their way anywhere else. 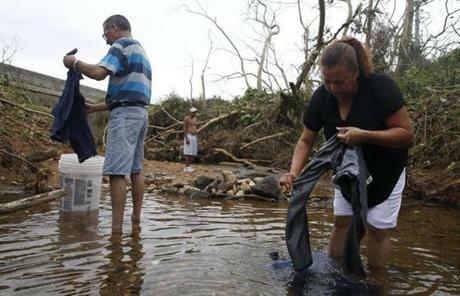 Elizabeth Nieves and Carlos Hernandez washed clothes in a river. Baus, a retired pilot, decided it was time to leave after her house was robbed. On Thursday, she awoke before dawn and found seats in the oppressive terminal for her and her 15-year-old daughter, hoping to make it to Pensacola, Fla. She had waited for eight hours, through two cancelled flights. Across the island, nearly all communications were down. The lines for gasoline took hours. People found their way to the airport however they could. Juan Morales and his wife were in their second day waiting. The couple had come from their home in Tampa earlier in the week, bringing friends and relatives $21,000 worth of medical supplies, water, and other necessities. Now they were trying to get home, but their flights kept getting cancelled. With little water or food, they felt stranded. As the afternoon wore on, cheers erupted when a Spirit Airlines flight rolled up to a nearby gate. But it wasn’t the flight Leah Rocca had been waiting for, and the 15-year-old from the central town of Morovis began to cry as she thought about what she was leaving behind, and what had been lost. Their three-bedroom home was completely destroyed, and her aunt was trying to take her and her sister, 5, to Atlanta. Their mom was staying behind, for now. “We have nothing left,” Rocca said. Hundreds of people waited for the ATM at a bank in Caguas. As night fell and a curfew took effect across the island, Yolanda de Valle Quiñones realized she could only survive so long on coffee and bottled water. 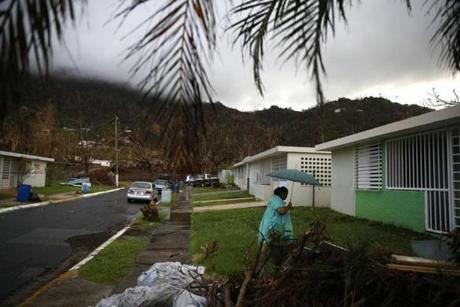 The 60-year-old from Cidra, south of the capital, was alone in her roofless house, inundated the week before. She had no functioning stove and had run out of cash. She couldn’t call anyone for help. So she awoke at 3:30 a.m. and began walking. She trudged for two hours until she arrived at a bank in nearby Caguas, where a queue had been forming. When it finally opened at 9 a.m., a line of hundreds of people snaked through a sweltering, treeless parking lot. As she waited beneath the rising sun, Quiñones began to feel dizzy. A bank official took pity on her and let her inside, where a generator kept an air conditioner running. She was among the fortunate who were able to withdraw the maximum $500 from her account. Across the street, where stoplights dangled precariously from sagging wires, similarly long lines stretched from a bank and a CVS. Remnants of trees, branches shorn of bark, lined the roads in jagged piles. Inside the bank, customers haggled with the staff for enough to get by on. Maria Carrasquillo, 71, said the bank gave her a three-month reprieve on her mortgage before she would have to resume her $344 monthly payments. The branch manager, who asked not to be named, said the bank was managing with just two private security guards, even though someone had damaged one of the cash machines outside the bank. As the line outside grew to more than 500 people, many with parasols to shield infants and the elderly from the broiling sun, Rebecca Gutierrez took her place at the end. The 57-year-old retired legal interpreter from San Lorenzo, about a 20-minute drive southeast of Caguas, said she had lost at least four pounds over the past week. “I can’t take this hardship,” she said. Her husband was in another line, waiting for gas. Without running water, she recently had to bathe in a creek near her home. Gutierrez said she had $40 left, leaving her no choice but to wait. She hoped to leave her home soon, if she could get a flight. 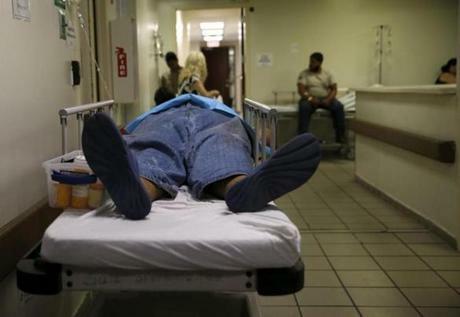 A patient lay in a hospital bed in the hallway inside the emergency room at HIMA San Pablo Hospital in Caguas. Later that morning, in the backyard of a two-family home in Caguas, Luis Alberto Ruiz Irizarry had reached his limit, too. The 78-year-old retired salesman tied a belt around his neck and tried to hang himself. When his daughter found him behind their home, she began to scream. Moments later, two neighbors rushed over and helped pull his limp body down from the roof. There was no way to call an ambulance, so they carried him to their Jeep. With his wife pumping his chest in the back seat, they sped to the nearby hospital. 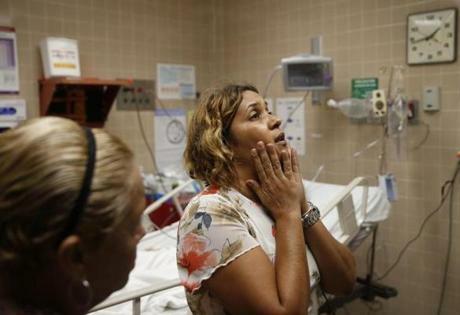 The hospital in Caguas was among about 30 of the island’s 62 hospitals that remained open. Fewer than a dozen were operating at full capacity, administrators said. Since the hurricane, the hospital has experienced a surge in demand, unlike anything its staff had ever experienced. On a normal day, the hospital admits about 250 patients. On Friday, they saw 400 patients, and another 150 arrived in the emergency room, triple the usual number, said Irma Estrada Rodriguez, one of the hospital’s directors. Doctors, nurses, and administrators like Rodriguez had been living at the hospital since the day before the hurricane, working on only a few hours of sleep. The hospital had any number of critical concerns. Its supplies were dwindling, putting basic operations in jeopardy. To keep its generators running – the hospital would be forced to close without them – the facility needs 1,500 gallons of diesel fuel a day. There was only about 3,000 gallons left in the 60,000-gallon tank. The hospital normally uses about 50,000 gallons of water in a day; since the hurricane, with so many to care for, they’ve been using more than twice that much. On Friday, only 130,000 gallons were left. Other urgent needs included oxygen and saline solution for intravenous fluids — of nearly 700 boxes available before the storm, just 38 remained. The supply of morphine had fallen from 2,000 vials in stock to 800. The hospital’s emergency communications systems was also failing, and its morgue was exceeding capacity, as few funeral homes could be reached to collect the bodies. The staff was now stacking the dead on top of one other. “We’re getting to a critical point,” said Carmen Morales, the hospital’s chief nursing officer. Myriam Ruiz Rivera waited inside the ER after her father, Luis Alberto Ruiz Irizarry, attempted suicide. In the dialysis ward, nurses were treating four times as many patients as usual. As a result, the patients – who would die without the treatment that filters toxins from their kidneys – were only getting about two of the four hours of dialysis that many of them need three times a week. On Friday afternoon, Dorka Carrillo was one of eight patients connected by tubes to the loud machines. The 42-year-old mother of two teenagers from San Lorenzo had been living in daily fear of dying since she discovered that the dialysis center closer to her home had suddenly closed. Carrillo went a week without treatment. On Monday, lacking enough fuel to drive to the hospital, she spent eight hours in a line for gas, turning off the air conditioning in her Nissan Pathfinder to save fuel. She couldn’t fathom the lack of planning for the recovery, and she worried about returning home, where her family had no power or running water and lacked enough food, especially for the strict diet of a dialysis patient. “It shouldn’t be like this,” she said. Another patient, Carmen Navedo, arrived at the hospital with a tumor so swollen she looked pregnant. She had gone without chemotherapy for her intestinal cancer for two weeks, and she was moaning from the pain. The road from her home, which was badly damaged and flooded, had only recently been cleared of downed trees and power lines to allow her to make it here, she said. 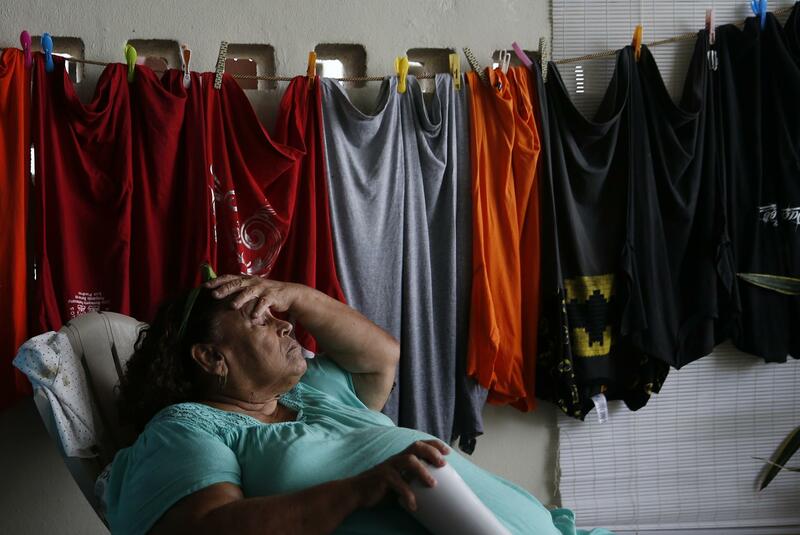 “It hurts too much to go to the bathroom,” said Navedo, 56, who lives in Naguabo on the east coast. She was eventually admitted to the emergency room, where she lay on a gurney in a hallway crowded with other patients. “This helps,” she said with a smile as drugs were pumped into her body. In a room nearby, Irizarry, the attempted suicide, lay shirtless on a bed, tubes in his throat. He was breathing, but doctors were unsure whether he had suffered brain damage. His daughter, Myriam Ruiz Rivera, hovered over his bed, still in tears. His medical problems has gotten worse in recent weeks, she explained. He kept worrying about all the trouble he was causing her, and told her he would take care of it. Without electricity and running water, many residents have struggled with other basics of life, such as how to clean their clothes. As a result, another long line formed in front of the Pink Coin Laundry in Caguas, where 100 washing machines and 60 driers whirred away, blasting more hot air into a steamy afternoon. “You come in here to do your laundry, but the sauna is free,” joked Selenit Gonzalez, the owner. She was using an old generator she bought after Hurricane Georges hit the island in 1998. Her husband, a mechanic, worked on it every night to keep it running. They have a groundwater well, allowing them to stay open, one of the only laundromats in the area to do so. Her main concern was getting enough diesel to fill the generator. Inside, Maria Rivera and her two children were loading $2.75 in quarters into four washing machines. They had waited eight hours in line. “This is what we have to do,” said Rivera, 37, drenched by the humidity. Sandra Alameda was still waiting in line, which stretched to the end of the block late into the afternoon. She and her twin sons brought hampers full of clothes. It was their first time at a laundromat. 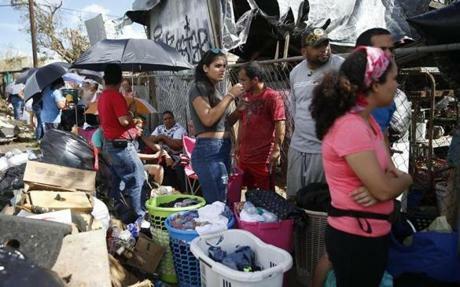 “I’m tired, hungry, and hot,” said Alameda, 45, who had come early in the morning from Gurabo, about a 15-minute drive away. Asked if she was angry that it might take months before the power returns, as local officials have warned, she flashed a wry smile. She would be back in a few days to do more of the family’s laundry. 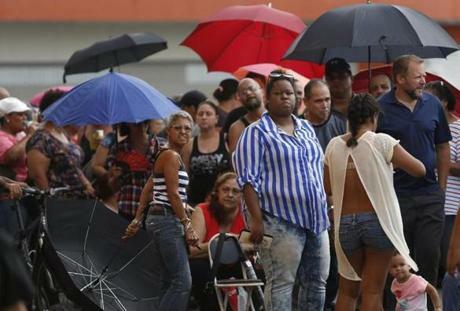 People waited in line for hours to wash their clothes at Pink Coin Laundry in Caguas. In Yabucoa on the southeastern coast, the first town here to be hit by the storm, looked as if it had been through a war. The City Hall had been partially destroyed and the local health clinic remained closed after sustaining significant damage. The normally lush mountains looked bare, with most of their trees fallen and stripped bare. At Ultra Top Fuel, where the gas station’s main sign lay in ruins on the asphalt, scores of local residents stood in a line with handheld fuel tanks. Many others had been there earlier. Benjamin Santana, 28, had been waiting for gas with his 3-month-old daughter in his arms for several hours, hoping the station didn’t run out of fuel before his turn arrived. “At least she’s not crying,” he said. In a public housing project up the hill, Carmen Charriez, her husband, and two adult sons, both of whom have disabilities, sat in lounge chairs in the open-air garage of the three-bedroom home where they lived for nearly 40 years. The family had slept there every night since the hurricane, which blasted the metal roof, viewing stands, and just about everything else from the basketball court across the street and into their concrete house. The family of five, including a nephew, rode out the storm by hiding in a hallway for hours. Since then, they had survived on chocolate bars and food neighbors had brought over. They had no money, and in their putrid refrigerator all that remained was a jar of Cheese Whiz. Most of their furniture and mattresses were soaked, and they were too afraid the roof might collapse to sleep inside. As Charriez explained how they had taken turns sleeping in the lounge chairs in their garage and in their old Toyota Camry, there was a crack of thunder and a flash of lightning. Soon, the skies opened and a tropical downpour brought another river of water rushing through the streets. Charriez looked up at the ceiling of the garage and saw a new streak of water seeping through the bubbling white paint. It was then that she and her husband decided they had taken enough risks. She picked up an umbrella, and her husband and sons carried their portable fans. A new home in their development had just opened up that day. It was time to start over there. Carmen Charriez walked across the street to the home they are moving into in Yabucoa.